eBay Photos That Sell teaches home-spun entrepreneurs how to create professional-quality product photos using a standard digital camera and a few handy tricks and inexpensive techniques. Anyone can sell their stuff online. The challenge is to do it better than the competition and get the best possible results, every time. If you're attempting to sell your guitar on eBay, a photo of Aunt Pearl June strumming it in the backyard isn't likely to cut it. Does that mean you need to hire a professional photographer or invest in expensive equipment? Not if you follow the ingenious advice in this book! eBay Photos That Sell reader Patricia A. Leonard from Seattle, Washington says, "This is a great book and definitely a rare find as few books focus on product photography. The steps given for shooting great photos of items you want to sell on eBay are simple and easy to understand. The techniques outlined are easy to follow and you don't have to be a professional photographer to understand what is involved. It has been proven that ads with great photos on eBay are more likely to be successful auctions and attract more bidders. 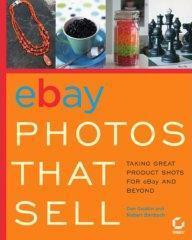 If you're serious about selling on eBay, this book is a must read." eBay Photos That Sell teaches home-spun entrepreneurs how to create professional-quality product photos using a standard digital camera and a few handy tricks and inexpensive techniques. With page after page of inspiring examples and expert insights, you'll figure out how to capture everything from hats to wineglasses to MP3 players. You'll understand what makes one photo better than another and discover how to create images that viewers connect with--ones that evoke the "I must have this" feeling. Ultimately, it will help you attract customers and make sales, without investing a lot of time or money.